For those growing up in the 1970’s and 80’s, a lot of us can remember when Robin Williams appeared on the small screen. Although he worked on The Richard Pryor Show in 1977, Williams’s big break came a year later. He appeared on an episode of the family sitcom Eight is Enough before he appeared on Happy Days as a character that gave him television immortality: Mork, an alien from Ork. Shortly after Robin’s appearance on Happy Days, the show’s creator the late Garry Marshall had been given the green light to do a spin-off series. Titled Mork and Mindy, Williams and Pam Dawber starred as the leading characters. This sitcom was the golden ticket to a promising—and diverse—career for Robin Williams. Robin McLaurin Williams was born on July 21, 1951 in Chicago. His parents were Robert, an executive for Ford, and Laura, a former model from Jackson, Mississippi. (One of Laura’s great-grandfathers was Anselm J. McLaurin, a senator and the 34th governor of Mississippi.) Robin had two older half-brothers—McLaurin Smith and the late Robert Todd Williams, who passed in 2007. Robin grew up in Lake Forest, Illinois, a suburb north of Chicago. He attended Gorton Elementary School and Deer Path Middle School. Robin was an introverted yet imaginative boy. He could amuse himself for hours playing with toy soldiers in the basement of the family home. On the other hand, Robin used humor to make his mom Laura laugh, and to get her attention. “(My mother) was the only woman who left Joan Rivers speechless,” he said gleefully in a 2002 interview. The Williams family moved to Bloomfield Hills, Michigan in 1963. Robin attended Detroit Country Day School, where he eventually became Class President. He also came out of his shell by playing numerous sports such as soccer, basketball and wrestling. Four years later, his dad Robert retired early from the Ford Motor Company and moved his family to the San Francisco area. Robin finished his secondary education at Redwood High School in nearby Larkspur. His graduating class voted him to be the “Funniest” and, ironically, “Most Likely Not to Succeed”. Following his graduation from Redwood High School, Robin Williams tried his hand at college. He began at Claremont (CA) Men’s College, majoring in Political Science. But Robin left soon after, transferring to the suitcase campus of the College of Marin in Kentfield, CA, which is north of San Francisco. He spent three years there and found his calling in theatre. Robin’s most noted role at the school was when he played Fagin in Oliver! His impromptu comedy and humor impressed his professors and colleagues even back then, though the College of Marin knew that he had to move on. Robin eventually won a full scholarship to one of the best acting schools in the United States. In 1973, Robin was one of 20 students accepted into the Juilliard School of Drama. It was a dream come true for him! Located in New York City, Juilliard is known as a top school for those pursuing their dreams in drama, music, play-writing and dance. Fellow alumni in drama have included Kevin Kline (who won an Oscar for Best-Supporting Actor as the bungling thief Otto West in A Fish Called Wanda), Val Kilmer (“Ice” in Top Gun) and Bern Nadette Stanis (Thelma Evans in the TV sitcom Good Times). Robin’s classmates included Mandy Patinkin (“Inigo Montoya” from The Princess Bride), William Hurt (Broadcast News) and Christopher Reeve—who portrayed the Man of Steel in four Superman films. Reeve and Williams, who became lifelong friends until Reeve passed away in 2004, were the only students picked by actor John Houseman (The Paper Chase) to be admitted into the Advanced Studies program during their first year at Juilliard. Robin was considered one of the top students in his class. However, when he was a junior, John Houseman told his up-and-coming protégé that he had “learned enough” at Juilliard. It was time for him to move on again. (Robin would later receive an honorary Doctor of Fine Arts degree from Juilliard in 1991.) Despite Houseman’s intentions being good, receiving this news was a crushing blow to Robin. Being letting go like that may have affected him for the rest of his life. After he finished at Juilliard, Robin Williams returned to the West Coast. He tended bar for a while before he managed to get up on stage to perform comedy. Robin’s stage debut was at the Holy City Zoo in San Francisco, which closed in 1994. He met his first wife Valerie Velardi, who worked as a waitress, while he tended bar and did his stand-up comedy. They married in 1978, and were divorced ten years later. Their son Zachary was born in 1983. Robin’s breakthrough came in 1977 in both film and television. He played two roles in the movie Can I Do It ‘Till I Need Glasses? On the small screen he appeared on Eight is Enough and on Laugh-In, as well as numerous roles on The Richard Pryor Show. The following year, Robin appeared as Mork from Ork on Happy Days. Then came the American Broadcasting Company (ABC) sitcom spinoff Mork and Mindy—and the rest was history. “Nanu! Nanu!” was the catch-phrase of Robin’s character Mork as the giant egg soared from Ork, into space and landing in Boulder, Colorado. As Mork literally broke out of his shell at the beginning of each episode, one could sense that Robin was also a butterfly, ready to emerge from his own cocoon. Williams and Pam Dawber would star in 91 episodes of Mork and Mindy (95 in syndication). Every week Mork would experience something new on Earth and, at the end of each program, report his findings to the never-seen Orson (voiced by the late Ralph James). While Robin thrived through comedy and parody, another ABC show What’s Happening featured during a dream sequence their own version of Mork and Mindy. The episode, titled The Last Page, had the late Fred “Rerun” Berry and Shirley Hemphill portray Mork and Mindy. Rerun wore Mork’s red outfit and boots, forgoing his trademark red beret with a brown wig. “He was a lightning storm of comic genius.” This was how the film director and occasional actor Steven Spielberg perceived Robin Williams. “Our laughter was the thunder that sustained him,” said Spielberg who directed him in 1991’s Hook. Robin portrayed a Peter Pan who finally grew up. Spielberg’s quote describes Robin Williams accurately. While he was still performing as Mork, Robin won the title role of the gruff, spinach-eating sailor in the 1980 film Popeye. Resembling the iconic character created by E.C. Segar, Robin played the sailor man just like his cartoon counterpart. He devised the walking-on-water bit himself. Robin also used a few bits based from the cartoon classics such as twirling the pipe in his mouth, using his pipe as a periscope while he swam underwater and the “old twister punch” which he used during the boxing match with Oxblood Oxheart (portrayed by the late Peter Bray). Carlo Pellegrini, who’s known as Mr. Amazing from the Amazing Grace Circus, also appeared in Popeye. Carlo played Swifty the Short-Order Cook who prepared Wimpy’s hamburgers. He also took on two other roles in the film—as a waiter and as a popcorn vendor. Carlo has fond memories of working with Robin, whom he describes as a “very kind and spiritual man”. Being a circus clown and not a comedian from Los Angeles, Carlo thought that Robin never perceived him to be “competition” or a “threat”. The two performers hung around a lot during the downtime; many of their conversations centered on philosophy. Several times in Malta when the cast wasn’t filming, the crew would have an Improv Night. One evening when no one would volunteer, Carlo jumped up—and Robin joined him. Later that same year, Robin Williams was seen on the Second City Television (SCTV) Network. He also reunited with his Popeye co-stars Shelley Duvall and Donovan Scott in the first Faerie Tale Theatre episode on the cable channel Showtime. Robin played the dual lead role of The Frog Prince. Shelley Duvall served as the Hostess and Narrator and occasionally appeared within the series’ episodes; Donovan Scott acted in three additional episodes. Films Robin Williams acted in during the 1980’s included: The Survivors (1983) with the late Walter Matthau and Jerry Reed; Moscow on the Hudson (1984) with Maria Conchita Alonso and Cleavant Derricks; Club Paradise (1986) with Rick Moranis and Twiggy; and another 1986 film whose title would soon become a synonymous catch phrase with Robin: Seize the Day. Robin Williams literally seized the day as his acting career blossomed. Things seemed to be looking up for him throughout the 1980’s and 1990’s. His movies were successful, and his comedy routines tended to play to packed houses. It seemed to be the perfect life for him. Robin was getting noticed by the Academy of Motion Pictures and Sciences (AMPAS) as well. He was nominated for the Oscar as Best Actor in three films: as radio disc-jockey Adrian Cronauer in Good Morning, Vietnam (1987); as the influential high-school English teacher John Keating in Dead Poets Society (1989); and as Parry, a homeless man in 1991’s The Fisher King. (Michael Douglas won as Gordon Gecko for 1987’s Wall Street, Daniel Day-Lewis won as Christy Brown for 1989’s My Left Foot and Sir Anthony Hopkins won for his portrayal of Hannibal Lechter in 1991’s Silence of the Lambs. Robin’s Juilliard classmate William Hurt was also nominated for Best Actor in 1987 as Tom Grunick in Broadcast News.) But Robin’s turn for Oscar gold would still be coming a few years down the road for him. 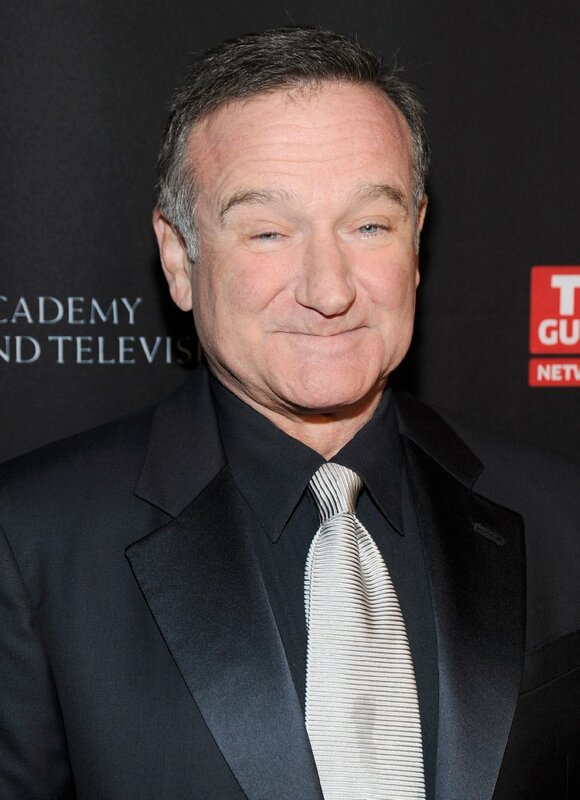 Audiences flocked to see Robin in such films as Good Morning, Vietnam and Dead Poets Society. His witty antics as Adrian Cronauer and John Keating made people not only laugh but think as well. Robin briefly reprised his Adrian Cronauer character during a 1988 telecast with the former space shuttle Discovery. “Good morning, Discovery!” he yelled before going into a pseudo-news dialogue then concluded with singing a parody he called “Earth’s Orbit” to the tune of the theme song of Green Acres. John Keating in Dead Poets Society was another memorable role for Robin. As an English teacher, he tried to show his prep-school students there was more to life than book-reading. Mr. Keating pushed the teens out of their comfort zones in order to find what they are destined to do in life. “Carpe Diem,” he would tell his students before he’d translate from the Latin phrase: “Seize the Day!” Needless to say, his teaching methods (such as standing on a desk) did not go over well with the boys’ parents though it eventually impacted his students. Yes, Robin Williams’s comedy and film career was heading where all of us would eventually like to get to in the job market during our lifetime: onward and upward. He seemed to living la dolce vita (Italian for “the sweet life”). Robin’s energy—whether on stage or on the big or small screen—looked fluid and flawless to those who watched him. He was a joy to watch, and he made us think. The late Harold Ramis directed Robin and a cast of comics in the 1986 film Club Paradise. In one scene he directed, Harold asked his star to perform at a faster pace. “Faster is not a direction,” Robin interjected. Harold then realized that he needed to rephrase what he wanted Robin to do in the scene. Each actor is different and has to be coached in a combined way that works for them, the director and the film itself. Dead Poets Society and The Fisher King were only a handful of movies Robin made to get audiences to watch. And it just kept getting better. Robin kicked off the 1990’s as an Everyman in an Earth Day special, followed by Cadillac Man with Tim Robbins. Then Robin portrayed another serious role—as Dr. Malcolm Sayer in Awakenings. Directed by Penny Marshall (Garry’s sister), it co-starred Robert DeNiro as a catatonic patient who is part of an experiment by Dr. Sayer. Awakenings was based from the late Dr. Oliver Sacks’s memoir of the same name. Robin’s role as the Everyman was prominent throughout the 1990’s. He played Peter Pan in Steven Spielberg’s 1991 film Hook. Robin’s Peter Pan literally grew up into an attorney named Peter Banning who spends very little time with his family. Peter’s children end up being kidnapped by Captain Hook (Dustin Hoffman). Tinkerbell (Julia Roberts) and the Lost Boys need Peter to once more find his youth and battle Hook in order to save his kids. Additional films that Robin appeared in during that decade included: Toys (1992); Jumanji (1995); The Birdcage (1996); and What Dreams May Come (1998). He lent his voice for two animated films in 1992—as “Batty Koda” in Ferngully—The Last Rainforest and as the big blue Genie in the Disney classic Aladdin. Robin reprised his role as the Genie twice more—in 1996’s Aladdin and the Prince of Thieves and in 1997’s Great Minds Think for Themselves. In between movies, Robin could be occasionally seen on television. He appeared as himself on The Larry Sanders Show in 1992. Two years later, he was on an episode of Homicide: Life on the Street and guest-starred, as Tomas, on a 1997 episode of Friends. Back on the big screen, Robin played the title characters in Mrs. Doubtfire (1993), Jack (1996) and Jakob the Liar (1999). He thrived in such roles as Daniel Hillard, an unemployed dad who transforms himself into a nanny named “Mrs. Doubtfire” whom his ex-wife (Sally Field) hires to care for their three children. Other characters Robin portrayed during the 1990’s were Osric in Kenneth Branagh’s 1996 film version of Hamlet and as Sean Maguire in Good Will Hunting (1997). Matt Damon and Ben Affleck co-wrote the screenplay for Good Will Hunting, which was directed by Gus Van Sant. The film was about Sean Maguire, a psychologist who taught Matt Damon’s character Will, a troubled genius, about life and using common sense. Ben Affleck, his younger brother Casey and Minnie Driver also starred in the movie. Things were definitely looking up for Robin Williams. After being eluded three previous times at the Academy Awards, Robin finally won the 1997 Best Supporting Actor for his role in Good Will Hunting. Matt Damon and Ben Affleck also won Oscars for the film with the Best Original Screenplay. With the new millennium slowly approaching, it looked as if Robin was riding the wave of success in his acting career. Several years before home computers and social media ran neck and neck to one another, Robin Williams was one of those personas that seemed to be everywhere. One minute he appeared in a new film, the next he was hosting Saturday Night Live. Blink a couple of times and he was hosting the 1986 Academy Awards or he’d be performing his stand-up comedy in An Evening at the Met. Blink again and Robin would be co-hosting the 1986 Comic Relief alongside Whoopi Goldberg and Billy Crystal on cable TV. A reporter at Time magazine retrospectively dubbed Robin as a “human Internet” after he passed away. And yet Robin’s work continued to flourish once the new millennium kicked in. He made another animated appearance as “Dr. Know” in AI: Artificial Intelligence (2001). A year later his work brought him some diversity. Robin played “Rainbow Randolph” in Death to Smoochy. He went back to doing his comedy act in Live on Broadway. He also traded in his good-guy persona and Everyman character to portray a pair of villains: as Walter Finch in Insomnia with Al Pacino and Hilary Swank; and as Sy Parrish in One Hour Photo. Robin appeared on the small screen as well. He appeared in an episode of Life with Bonnie and another on Law & Order: Special Victims Unit. He also returned to television in a series called The Crazy Ones. Robin played Simon Roberts who owned an ad agency. Sarah Michelle Gellar played Simon’s daughter Sydney. Despite being created by David E. Kelley (Chicago Hope, Picket Fences), The Crazy Ones lasted just one season. As the Rolling Stones might say: “You can’t always get what you want.” That statement seems to apply to everyone. Maybe we’re not meant as people to have everything we want in life. This way it gives us the opportunity to be thankful for what we already have. It gives us the motivation to look forward to our adventures down the road as well. Successes and failures are not always “good” and “bad”—sometimes either one can be okay. As previously mentioned, Robin Williams and Valerie Velardi were married from 1978 to 1988. Their son Zachary was born in 1983. Shortly after his first divorce, Robin married Marsha Garces, who had previously worked as Zak’s nanny. Robin and Marsha wed in 1989 and had two children Zelda and Cody. The couple divorced in 2010. Robin wed Susan Schneider in late 2011. She works as a graphic designer and has two children from a previous marriage. Robin had described, in a 1991 interview with the Chicago Sun Times, that having children was like having a “power surge in your heart.” Despite his hectic life with acting and occasionally performing his stand-up comedy, he enjoyed a quiet life with his three kids. Robin didn’t need to perform any of his well-known TV or film personas at home. He could just be himself amongst his wife and children. During their marriage, Robin and Marsha founded the Windfall Foundation. Monies would then be sent to various charities including: Doctors Without Borders, the Pediatric AIDS Foundation and those at the University of California-San Francisco. Robin graciously volunteered for the United Services Organizations (USO), performing for US troops stationed around the world. He could be seen promoting ads and helping out at St. Jude’s Children’s Hospital and the Make-A-Wish Foundation. Robin even sent his toy soldiers that he played with for hours on end as a child to a St. Jude’s patient who also enjoyed army-men. Robin’s generosity played out amongst his friends as well. He co-hosted, along with Billy Crystal and Whoopi Goldberg, Comic Relief. Monies raised went towards benefitting the homeless. Robin also had it written in his contracts for the homeless to work on his movie sets. He believed that this way they could build on job experience as well as their confidence. Both went hand in hand. Robin continued his friendship with his Julliard roommate Christopher Reeve. When Reeve ended up a quadriplegic due to a 1995 horseback-riding accident, his pal Robin was there for him. Robin not only helped pay for some of the medical expenses, but he used his sense of humor to get the Reeve family through this difficult time. He also became a surrogate dad to Reeve’s youngest son Will. Robin and his ex-wife Marsha’s charity The Windfall Foundation donated to the (now) Christopher and Dana Reeve Foundation, which is dedicated to curing spinal-cord injuries. A 2006 AARP cover story briefly mentioned a moment between Robin and Chris Reeve. Reeve was giving a speech for his charity. During the talk, he went into uncontrolled spasms. Robin, who was in the audience, ran up on stage and held out his friend’s arms shouting: “Look up in the sky! It’s a bird! It’s a plane! It’s Superman, and he’s trying to fly again!” Thanks to his friend’s spontaneous action, Chris quickly calmed down and continued his speech. Robin enjoyed spending time with his friends and family. He enjoyed biking with friend and Tour de France winner Lance Armstrong. Robin and Marsha were staunch supporters of Lance’s charity—LiveStrong. (Two of Robin’s Redwood High School classmates—Gary Fisher and Ned Overend—were heavily involved with biking as well.) Robin enjoyed the arts and watching his third wife Susan paint. He was gracious to his fans. My friend Mike Mays and his pal Greg once met Robin and a few members of his family in Chicago at a hot-dog stand. Mike and Greg had the opportunity to shake Robin’s hand and thank him for his work in film and television. 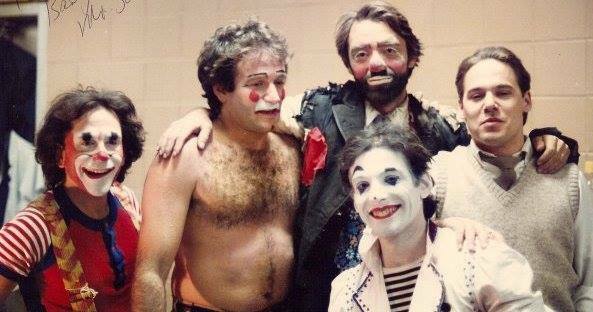 Yes, Robin Williams tended to be a jack-of-all-trades as a performer. He always seemed to excel in entertaining us through film, television, theatre and his stand-up comedy. As Eric Dodds of Time magazine eloquently put it in the August 25th, 2014 issue, we were “Basking in Robin” (pages 56-7). Who else could play five different U.S. Presidents like Robin Williams did? While only impersonating the voices of Lyndon Johnson and Richard Nixon in Good Morning, Vietnam, Robin portrayed Ulysses S. Grant in 2003’s Freedom: A History of Us, as Dwight D. Eisenhower in The Butler (2013) and as Theodore Roosevelt in the Night at the Museum trilogy. And this blue-eyed soul continued to enjoy life. Robin once stated the three things that made him happy were his family, work and creating. In his films he especially enjoyed the challenge of working on the emotional scenes. Whether he was teaching Matt Damon about life in Good Will Hunting, or butting heads with Bob Gunton in Patch Adams or the late Bruno Kirby in Good Morning, Vietnam, Robin never failed to get our attention and draw us into the film. Even as he grew older, that impish grin and his boyish looks stayed with him. Robin McLaurin Williams was found dead on August 11, 2014 by his manager. Tragically at age 63, he hanged himself at his home in Tiburon, CA. Robin was cremated, and his ashes were released into the San Francisco Bay. Shortly after his death, it was made public that Robin was in the beginning stages of Parkinson’s disease, which affects the nervous system. He was not ready to go public with his illness, though after he died it was diagnosed as “Diffuse Lewy Body Dementia” (DLB). Some may think this illness was the tipping point that led to his suicide. 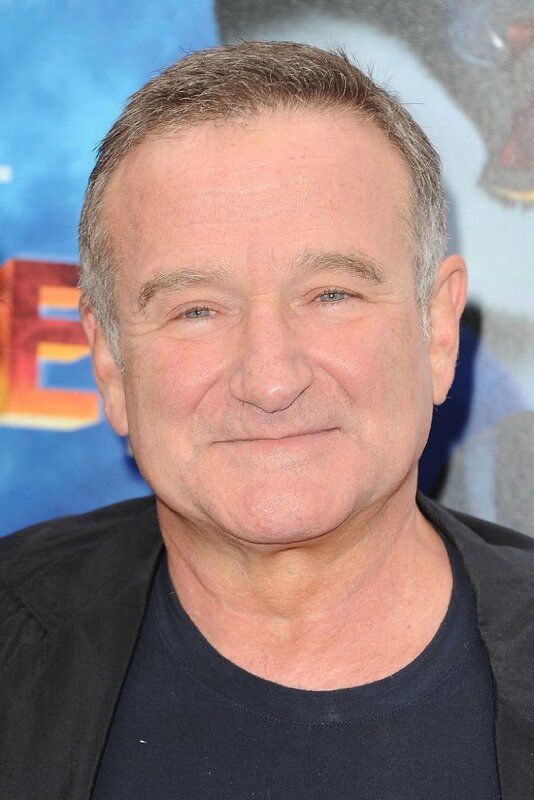 Robin Williams is survived by: his wife, Susan Schneider; his three children Zachary (now 33), Zelda (27) and Cody (25); his daughter-in-law (Zak’s wife Alex); his half-brother McLaurin Smith and his family. Condolences are extended to: Zak’s mother and Robin’s first wife Valerie Velardi; Zelda and Cody’s mother and Robin’s second wife Marsha Garces; and his fans and friends worldwide. --The Little Prince by Antoine De Saint-Exupéry. Zelda Williams concludes her tweet for her dad: “I love you. I miss you. I’ll try to keep looking up —Z.” No words are necessary for this loss either. RIP, Robin—you are sorely missed. Cho followed Pritchard’s advice by founding #BeRobin to assist the homeless in the San Francisco Bay area. On her Web site (margaretcho.com), it shows rock bands taking to the streets to raise funds and the Glama-Rama Salon giving free haircuts to the homeless. Others took to this suggestion as well. Zak Williams helps out at a local prison while his wife Alex works at Human Rights Watch. Shawn Levy, who directed the Night at the Museum trilogy, remembered how Robin always brought Make-a-Wish children to the film sets. Levy best summed it up in an interview with People how Robin enjoyed taking part in volunteer work and how it “wasn’t a check-writing thing”. By helping others through volunteer work as Robin Williams did, we can all make a difference together. Even though it’s already been over two years, it’s still hard to believe that Robin Williams is no longer with us. Robin was a jack-of-all-trades in the world of comedy and drama—on stage as well as on the big and small screens of film and television. His characters always seemed to resonate with audiences around the globe. He is a talent that will always be remembered yet he’s still missed. I honestly must admit that such a tribute to a great entertainer like Robin is of a high magnitude. Nobody should attempt it alone. I’d like to thank Barry Lubin, Mike Christensen, Carlo Pellegrini and Jeff Gordon for sharing their memories of Robin as well as the enclosed photo taken with him at the Big Apple Circus. Also, kudos to my buddy Mike Mays and his pal Greg who briefly got to meet Robin and to shake his hand. Finally, as with my online editorial Red Vineyards Await on the Dutch painter Vincent Van Gogh (dated September of 2014), neither the staff at Consciousness Magazine nor I glorify or condone Robin Williams’s suicide. This tribute to Robin reflects on a celebration of his life and all the joy and memories he contributed to the world. Outside of the limelight, he unselfishly found time for charity work and helped the homeless find employment on his film sets. We should all try to #BeRobin and make a difference in society—and not just through our wallets or pocketbooks.